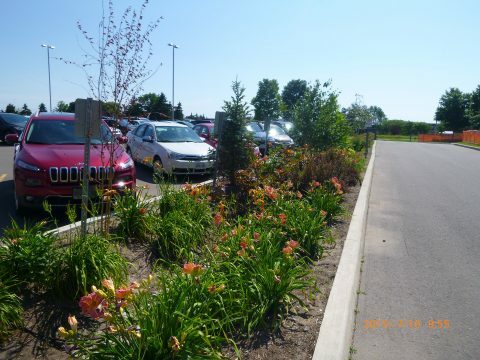 The STEP Water partners have developed and monitored many successful projects that demonstrate the benefits of green infrastructure (GI) and low impact development (LID) for stormwater management. Despite the proven success and benefits of GI, there are still barriers preventing wide-scale implementation, particularly on private property in existing developments. This is largely due to the associated capital costs. The aim of this project is to find ways to overcome this hurdle through aggregation, where private and public properties are grouped together to facilitate the communal and cost-efficient management of stormwater. As part of this project, the potential of the provincial Drainage Act (R.S.O., 1990) to assist in the aggregation process is being considered, since applying the mechanisms available within the Act will result in cost savings as well as the optimization of feature selection, sizing and overall performance. In July 2017, STEP Water hosted a workshop attended by nearly 100 stormwater management professionals in order to critically evaluate the instruments and processes within the Drainage Act. They examined the potential application of the Act to facilitate implementation of decentralized stormwater management systems in urban retrofit environments. A white paper has been written which summarizes findings on this topic; it has been condensed to a three-page position paper to concisely describe our views. Our position on this issue is guiding our current work as we continue assess the feasibility of using the Drainage Act for urban stormwater management. A study has been initiated in Mississauga to further this work and develop a process for communal stormwater management in urban environments using the principles in the Drainage Act. This undertaking will provide an aggregation framework and address important legal questions surrounding the application of the Drainage Act as a remedy to current urban stormwater challenges. The stormwater Drainage Act study will also identify the cost savings that can be achieved by aggregating private and public properties for stormwater management. For more information on the Drainage Act contact Kyle Vander Linden at kyle.vanderlinden@cvc.ca. In addition to cost savings, the project will examine the feasibility of different types of financial incentives to facilitate uptake of GI on private property. To this end we have conducted an investigation of the economics associated with implementation of GI. The findings have been summarized in an economic discussion paper. Next steps include developing a model that will facilitate calculation of the triple bottom line as well as avoided cost associated with implementing GI. These values will then be weighed against any marginal costs associated with administration and inspection to formulate a benefit allocation equation that can be used to determine funds available to incentivize implementation of GI on private property. Contact Kyle Menken at kyle.menken@cvc.ca for more details on economic incentives. » K. Smart Associates Ltd.